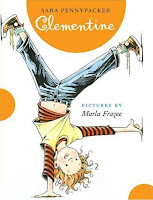 "Clementine is silly and funny and a really great story. I liked it a lot. I like where Clementine cut her own hair off because she also cut Margaret's hair off first. The pictures show Margaret and then Clementine's cut hair. I laughed and laughed. My favorite thing is the way Clementine talks because it is like how I talk, and my favorite character is Clementine's little brother because she calls him vegetable names." "We read this to Nora on a plane trip and it held her attention the whole flight--we read it straight through! I enjoyed reading Clementine because it was as funny for me as for Nora. Clementine reminds me that all the things that can frustrate me in my own children are the things that will serve them well later on. "